While it appears to be a victory for Yerevan, Azerbaijan remains one of Belarus's largest weapons customers. Armenia has managed to block a significant arms sale from Belarus to Azerbaijan, Belarusian and Armenian sources have reported. 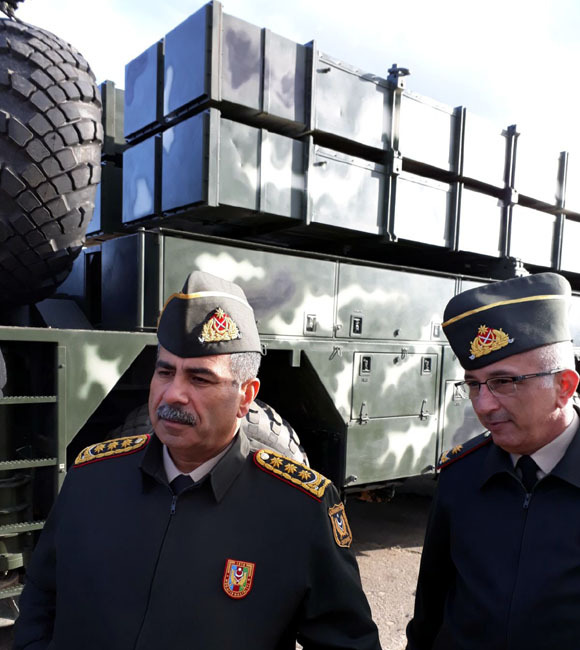 Azerbaijan had long been looking at Belarusian-made Polonez missiles as a means of countering Armenia's acquisition in 2016 of Russian Iskander missiles. When Azerbaijan Defense Minister Zakir Hasanov visited Minsk in October, the defense ministry released photos of him in front of a Polonez. Azerbaijani media reported the deal as all but done. “Azerbaijan Answers Armenia with Lukashenko's Rockets,” a headline in Haqqin.az read. But now a Belarusian military analyst, Aleksander Alesin, has said that Armenia succeeded in blocking that deal. “We wanted to sell Polonezes to Azerbaijan,” he told Russian newspaper Komsomolskaya Pravda. “But Armenia, our partner in the CSTO, was against it,” he said, referring to the Collective Security Treaty Organization, the Russia-led military alliance. “The deal didn't work out, and probably the first [export] customer for the Polonez will be Kazakhstan,” Alesin said. Sputnik Armenia reported that a source in Armenia's Ministry of Defense confirmed that account. “Our source reported that Armenia, at the very highest level, pointed out that deals threatening the balance of forces in the zone of the Nagorno-Karabakh conflict were unacceptable,” Sputnik reported. Since 1994 Armenian forces have controlled the territory of Karabakh and seven surrounding districts of Azerbaijan, which Baku has pledged to get back, by force if necessary. “In his [the source's] words, until now Yerevan has closed its eyes to the fact that Belarus has over the years delivered a great quantity of weapons and military equipment, helped modernize Azerbaijan's fighters and strike aircraft Su-25 and Su-27, but now Armenia has decided to not stay quiet,” the Sputnik report continued. According to data from the Stockholm International Peace Research Institute, Belarus also has supplied Azerbaijan with T-72M1 tanks and various artillery pieces over the past ten years. And it's not as if Belarus has completely cut Azerbaijan off. Elsewhere in the Komsomolskaya Pravda interview, Alesin describes Azerbaijan as “one of [Belarus's] biggest partners. We sell them air defense systems, in particular modernized Buk-MB air defense systems. In October firings were carried out there [Azerbaijan], the Azerbaijanis were pleased and there are prospects for greater cooperation.” Meanwhile, he added that Belarus will soon start selling some unspecified “non-lethal weapons” to Armenia. The battle between Armenia, Azerbaijan, and Belarus is analogous to a larger one between the two Caucasus foes and Russia. Russia has sold billions in weapons to Azerbaijan, while adhering to a mutual-defense pact with Armenia, and also providing Yerevan with weaponry at cost.